The open interest of options can be a misleading figure since the exposure of option buyers is limited to the premium paid. The open interest, however, is calculated as the notional value of the contract (or the option premium plus the strike price). It’s more pertinent to look at the build-up of open interest in the futures segment. 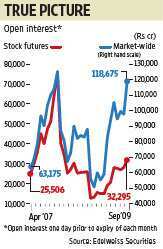 Open interest in the single stock futures segment has more than doubled in the past seven months, but then even the markets have doubled in the same period. The rise, therefore, seems to be primarily because of the increase in share prices, and there wouldn’t be much of a build-up in terms of number of contracts. An important indicator tracked by derivatives analysts such as Radke is the ratio of single stock futures as a percentage of the total futures market. This had reached a peak of 79.5% in early 2008, and currently stands at 66.5%. In terms of leverage, therefore, there still seems to be a long way to go before the markets look overheated. But this doesn’t mean that traders are running shy of the derivatives market in general. It must also be noted that most traders now prefer taking positions in the options market. Since risk can be contained using options, taking positions in this segment doesn’t entail the risks of high leverage in single stock futures. If and when the markets correct, there is unlikely to be as much pain as in early 2008.